DPT is happy to announce the release of our new pool dining table benches, the bench is styled to compliment our range of pool dining tables. They are manufactured using the same materials as our pool tables so they are a perfect match when it comes to the colour of the pool tables. The benches have been designed around the pool dining table range with the length and height just right. They come fully assembled, ready to use, so you won’t have to mess around setting them up when they arrive. The Pool Dining Table Benches are manufactured from a wooden 36mm seating top which is trimmed in a match edge material. 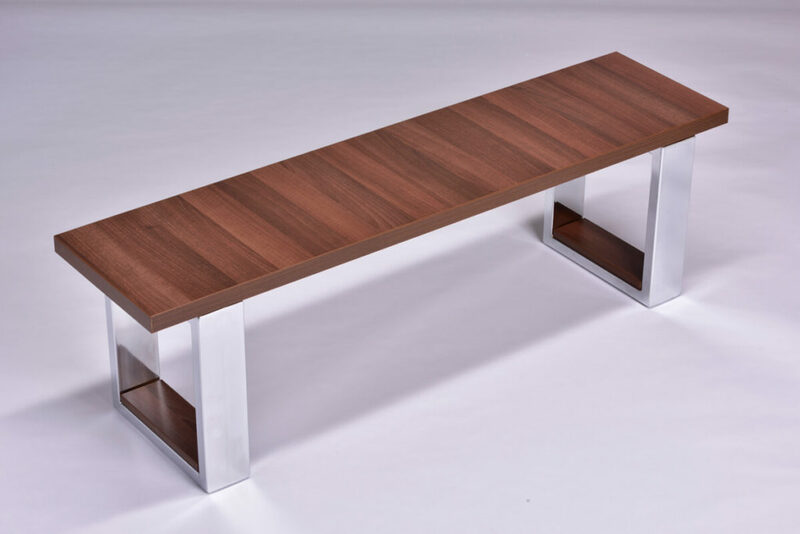 The bench top is fixed to and sits on a pair of silver chrome finished heavy duty fabricated steel legs. We have fitted a wooden trim with a matching wood finish to each leg to complete the look. This really gives a fantastically stylish look to the bench. It is also important that the bench legs don’t damage the flooring that they are sitting on. Keeping this in mind we have fitted felt pads to each leg to protect your flooring. The benches are available in the following finishes: Oak, Black, White, Walnut, Dark Walnut and Grey. All DPT products are made to order and the manufacturing time for benches is 3-4 weeks from order date. Each bench can seat 3 people comfortably. Like all DPT products, our benches are manufactured in our factory in the UK.